I came to the Smithsonian in the summer of 1962, excited about the opportunity to apply my academic training in the history of science to my curatorial responsibilities for the museum's electrical collections. It has indeed been an exciting time, largely because so much that happened was unanticipated—minor events that led in unexpected and often fascinating directions. One of the earliest of these occurred in 1966 when a Westinghouse engineer named Field Curry asked if I was interested in submarine telegraphy—a subject that had piqued his interest because a distant relative, Cyrus Field, had organized the expedition that laid the first telegraph cable across the Atlantic Ocean 100 years before. The result has been a series of activities that have defined one of the threads of my career. A collecting trip to Heart's Content, Newfoundland, (the western terminus of the Atlantic cable) in the spring of 1968 was followed by a second in the summer of 1974 to be present at the reopening of the cable station as a museum. Numerous research projects, collecting efforts, and exhibitions have occurred since. Most recently the 150th anniversary prompted me to look anew at surviving portions of Cyrus Field's correspondence that had been given to the Smithsonian by his daughter, Isabella Field Judson, in the 1890s. The result is a small display in the entry to the museum's Archives Center, where these letters found their new home. Fortuitously, the center is located in a section of the museum currently devoted to enterprise and innovation: Field was an extraordinary entrepreneur whose achievement rested on technical innovations made by his engineering and scientific colleagues. It was a new challenge for me: curating a display in which the focus would be on documents rather than objects. This blog is a review of some of my thoughts as I pursued it. Practical electric telegraphs were invented in England (by Charles Wheatstone) and the United States (by Samuel Morse) in the 1840s. Coincidentally, relatively large steamships were being built and gutta percha (a plastic tree sap similar to rubber) found its way west from Malaysia. Innovative modifications of these would be critical in extending the telegraph lines under deep water: gutta percha as an insulating material that could be extruded around the copper wire, and ships that could be modified to lay the cable in a straight line. A cable across the English Channel in 1850 failed, but a successor in 1851 was eminently successful and was soon followed by others—across the channel and under the waters of the Mediterranean. In America, Frederick Gisborne saw that a short cable could connect the western edge of Newfoundland to the mainland through Nova Scotia, and if land lines were constructed to the eastern end of the island it would be possible to collect messages off of ships from Europe as they passed on their way to Boston and New York. These messages (especially those of interest to newspapers and financial businesses) could then be transmitted by electric telegraph, beating the ships by two or more days. But Gisborne didn't foresee the difficulty of stringing wires across the island, and his operation went bankrupt. A chance encounter in 1854 led Cyrus Field to assume responsibility for Gisborne's company and expand its scope to include a telegraph cable from Newfoundland to Ireland. In earlier studies and exhibitions, I had been content to simply note the role played by Cyrus Field (1819–1892), a young American businessman who had made a modest fortune. Field was looking for something else to do when he became involved with a project to lay a telegraph cable across the Atlantic. After momentary success and wrenching failure in 1858, he led another cable effort that fully succeeded in 1866. My interest was more in the scientific and technological achievements, which lent themselves to being illustrated by objects. Now I was to feature a person as a businessman and promoter. The cable, and the techniques used to lay and operate it, were innovative. But the focus here would be on Field's leadership of the enterprise—as an entrepreneur. His strengths lay in his sense of purpose, his integrity, his ability to inspire and persuade others, and his resilience. Turning to his correspondence I found that these characteristics almost leaped from the pages. The letters, like objects, provided contemporary evidence, undisturbed by time. The historical sequence of events provided an organizational framework: his original inspiration was enough to excite others and move things forward both technically and financially, but at a speed that led to incautious judgments and failure. His response was to seek better advice and to try again. It could be seen as a nice case study in entrepreneurship. The letters provided critical support, joined by a few objects and graphics. Here are some that I consider highlights. At age 20, Field was hired as an accountant at a paper wholesaler in New York. Within a year it went bankrupt and he was left to settle the debts. He promised himself that eventually all creditors would be repaid. This letter was one of several that impressed me. 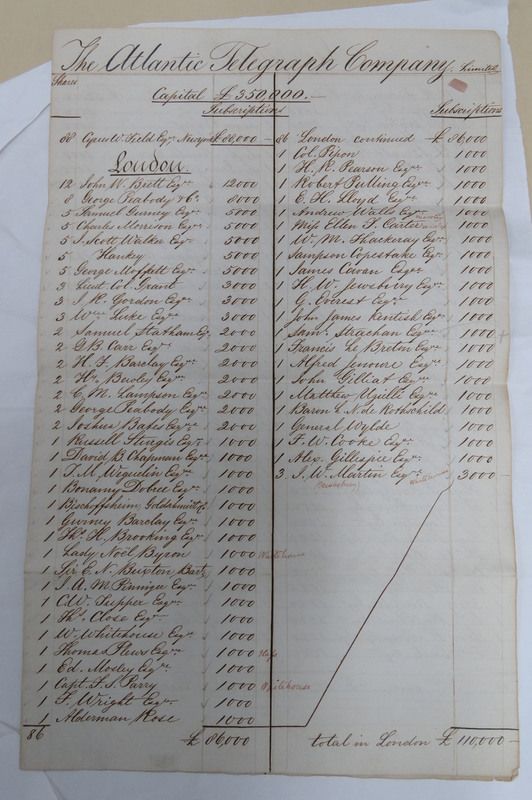 Initial support came from friends in New York, identified in this document from the Judson collection, but the real money, and the necessary skills, were in Britain. On top of that, he needed help from governments on both sides of the Atlantic. The letters, fortunately, provide a wealth of evidence about his contacts. Several are included in the exhibition, but two were especially telling to me. After failed attempts to lay a cable in 1857, the following year two ships, each with a little more than half the total amount needed, met in mid-ocean. Cable ends were connected and the ships proceeded in opposite directions. Three times the cable broke; it seemed that not enough cable remained and the ships returned to Ireland. This letter displays the resigned despair of the Board of Directors. Field's response was to recalculate the length of cable left and go back to try again. And succeed. There were celebrations, especially in the United States—which are also amply documented by the Judson papers. But after a month the cable ceased to function; a failure that has been attributed to the haste taken in the operation and the lack of quality control in producing the cable. Most of the blame has been placed on the insistence of the British electrician, Edward Whitehouse, that high-voltage electrical pulses were needed to overcome the resistance of almost 2,000 miles of copper wire, causing a breakdown in the insulation. What Whitehouse didn't realize was that as pulses of negative electricity passed through the cable they attracted positive charges in the water. The result was that the pulses slowed down and spread out, making them difficult to detect. What was needed was a sensitive receiver, not stronger signals. It is not generally known that Field's confidence in Whitehouse was partly due to his trust in Morse. The two, Whitehouse and Morse, had performed earlier tests on land, where the cable was surrounded by air instead of water. The embarrassing failure in 1858, and similar problems with a proposed cable to India, promoted an investigation by a Parliamentary commission. It concluded that the major problems could be overcome by improving quality control, and the enterprise continued. Further delays, in part caused by the American Civil War, were fortuitous: the Great Eastern, which had failed economically as a passenger ship, became available. Carrying the entire length, it laid a successful cable in 1866. The brilliant young Scottish physicist William Thomson was a crucial figure throughout—calculating the shape of the electrical pulses and designing a sensitive detector. He determined the forces needed in laying and retrieving the cable and was a participant in every expedition. I was especially pleased to find this letter in the archival collection. Field never doubted the ultimate outcome, and for him the cable enterprise was more than just a project. It was a means of expressing his personality, of interacting with people. Among the many letters not included in the display are several from James Anderson whom, Field had met on one of his many trans-Atlantic trips and recommended to be captain of the Great Eastern. It is clear that they developed a warm friendship that endured for the rest of Field's life. There are difficulties in displaying letters, especially in making the pertinent contents legible. In this modest example, we were content simply to repeat critical words in the accompanying labels. But even if the letters cannot be easily read through protective covers, as objects they still have special strengths: they give us direct physical contact with the authors. In developing the display, and this blog, I am greatly indebted to Hal Wallace (who now has curatorial responsibility for the electrical collections) and Craig Orr (archivist in the Archives Center). Also I appreciate the opportunity given me by the Archives Center to return to a subject I've always found so intriguing. Bernard Finn is curator emeritus and namesake of a major scholarly award in the field of electrical history, the Bernard S. Finn Institute of Electrical and Electronics Engineers History Prize.